At Wal-Marts all over the country, DC Comics makes stories available featuring their greatest heroes. The general purpose seems to be to get comics in the hands of new readers, perhaps even those that do not have easy access to a comic book shop. The general public will read this as “kids,” and in some cases, they’re not far off. 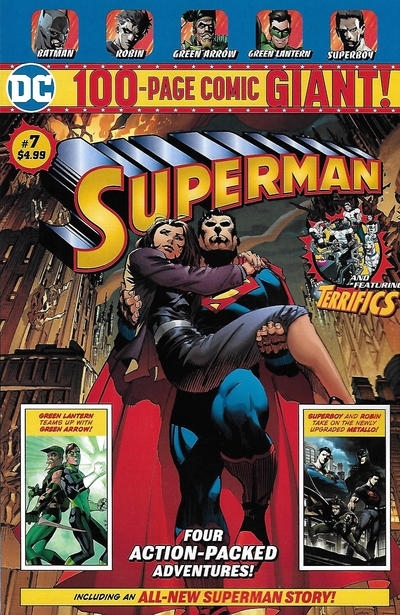 That’s why it’s disturbing that the original content offered up in Superman Giant #7 is literally twelve pages of Lois Lane being repeatedly tortured and murdered. Tom King responded that what he was exploring was how our thoughts go to worst case scenarios when we cannot contact a loved one. Unfortunately, that aspect was lost in the graphic depictions of the various Lois Lane scenarios. This story direction led to various complaints from readers. The general feeling is that a comic placed next to Pokemon, Yugioh, and other items geared towards children shouldn’t include such graphic violence towards apparently no story goal. This is evidence that the meaning of Tom King’s story was lost. Instantly, comparison came to the women in refrigerators trope, where the suffering of a female supporting character is used to motivate the male protagonist. It also drew comparisons to King’s current series Heroes In Crisis which has used character deaths as the basis of a mystery. This came at the same time as a solicited cover for an issue featured Poison Ivy apparently a victim of the mysterious killer. Was this a bad move by DC Comics? The general assumption is that yes, it was. While most critics and fans have, and still, support the perception that comics are not just for kids, the general public still sees comics, especially presented in a market as general as Wal-Mart as being approachable by children. The efforts of DC Comics in expanding its market has resulted, at least temporarily, in a plethora of bad press. It also begs the question of editorial direction at DC. With the direction of the adaptations in other, more visible media being more and more mature and violent, the pressure comes to reflect that in the source material. Unfortunately, this can backfire and once again cut off more accessible markets to publishers.